Globe Prepaid offers SURF20 with 400MB for one day. It's the best deal in prepaid today. Why? Here's everything you need to know. We have previously talked about Globe Prepaid Surf20 promo which was made exclusive to Cebuanos in Sinulog Festivities week. Guess what, the promo is still on and it seems to be getting a good following among Globe Prepaid users. Personally, I'm an avid user of GoSurf50 in my prepaid phone but since the Surf20 was rolled out last month, the latter became my official data worker. The "wonderful" network is trying to cook the Surf20 promo here in Cebu before they eventually offer it to other users nationwide. And in my day to day usage, I have seen a bucket-full of great reasons why Surf20 is better compared to other data promos of the network. Know more about this promo as I dish out every essential points you need to know about Globe Prepaid Surf20. This "all-day surf" promo is bundled with 400MB of data valid for 24 hours. Just like the GoSurf plans, Surf20 offers the same bulk-data scheme which allows users to enjoy internet activities without worrying about being throttled by the network. It's pretty cheap considering that it would only cost you Php 20 per day. If you do the math, this is equivalent to 12GB of data a month for an accumulated cost of Php 600 which is more affordable than the 5GB offer of GoSURF999. This promo seems to be perfect for moderate to not-so-heavy users who grab a considerable number of data chunk in a day. How to Subscribe in the Service? Globe Prepaid subscribers could avail the service by texting SURF20 to 8888. It is also advisable to wait for the confirmation message before turning on your cellular data toggle. Likewise, the network will push SMS notification when your registration expires. What happens beyond 400MB usage? Regular browsing rates apply once the 400MB allocation is used up. However to protect users from being charged automatically, the network will cut the current browsing activity to keep everyone prompted. Should there be unused data after 24 hours validity period, it will be forfeited. One good thing about SURF20 is that it does not require a maintaining balance to use the service. 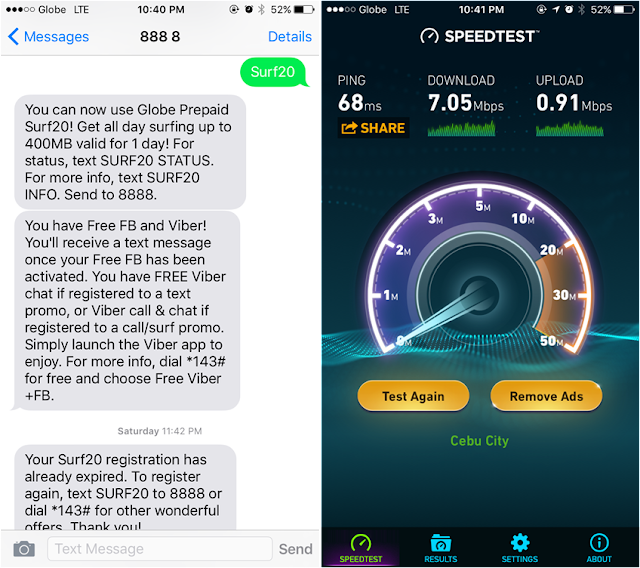 Check out the series of SURF20 notification messages below alongside a random Speed Test in Globe's largest LTE network while registered with the promo. We have stated that this promo is only available in Cebu. However, you can still use it in other areas in the country as long as you register the promo here in the province. This means that if you have registered here in Cebu before travelling to Manila, you can still use the said service. Inquire about the status of the service by sending SURF20 STATUS to 8888. You can also opt to stop the service by texting SURF20 STOP to 8888. We have previously pitted the Surf20 to other surf bundles of the network. The closest in the competition are GoSURF30 and GoSURF50. The former is quite a tight deal with less data allocation of 100MB bundled with 200MB free content allocation intended for Spotify Basic, Games and HOOQ trial. There's also 50MB for Youtube and Dailymotion. Of course, there is also a stiffer battle against GoSurf50 which gives 350MB of pure data allocation, 400MB free content allocation for Spotify Basic, Games and HOOQ trial and 100MB Youtube and Dailymotion allocation. If you're a music lover and a gamer, the 350MB + 400MB + 100MB bundle of GoSurf50 is a very welcome addition which runs for three days. However, SURF20 offers flexibility in using your data allocation. Of course, Facebook and Viber are now free in all of Globe's internet promos. To help you manage your data allocation, check the details below on how you can maximize your Internet activity. For the purpose of this consumption guide, Globe is categorizing internet users in four different classes - Ultimate Surfer, Social Media Savvy, Video Stream Addict and Audiophile. However, I think Globe is positioning this product to the social media savvy demographics so we'll show you how these users use their 400MB data (See graph below). Like me, these are the type of users with a world full of stories in online media. Based on my data usage of Globe Prepaid SURF20, here's a comprehensive infographics to guide you on how to manage your data. Hover the Donut-shaped graph to see the MB data usage in each of the basic mobile activity. Basically, a simple social media post would cost you 35KB; a 47-minute video streaming costs almost 200MB. One music download is 6MB on average and one webpage consumes 1MB. 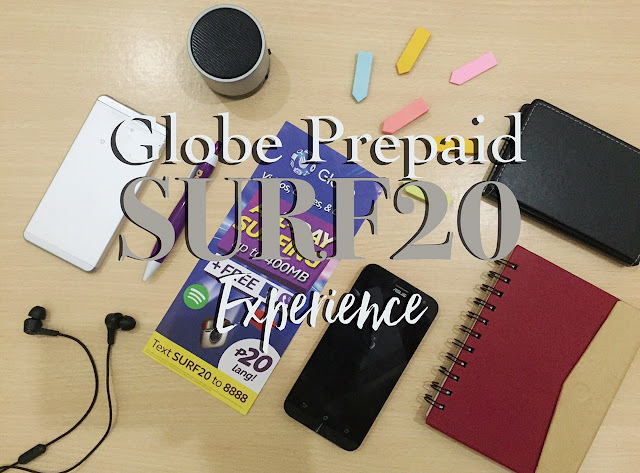 Globe Prepaid has been consistently offering varied options in terms of data consumption; and the SURF20 is, by far, the best value-for-money offering from the network. It easily shades other prepaid promos of other networks, even some of the GoSurf offerings. Likewise, it also allows you to be flexible on your data usage due to the fact that it is giving you the whole 400MB to consume in any online activity that you want. Yes, this is the best deal in prepaid, as of this writing. Cebuanos are very lucky to experience this promo before anyone else in the country; and I hope Globe could also make this available in other parts of the Philippines.